OS grid reference TG 3832 1564. On a slightly raised area of land just a little north of the River Bure at Holme, Norfolk, lie the quite solitary remains of St Benet’s Abbey – with it’s church and gatehouse. A little to the north there are some more earthworks and fish ponds from what was once a large, thriving religious foundation. To the north-west of the ruins an old windmill now, alas, without its roof and sails looks forlorn but is, in fact, a more recent building built on the abbey’s lands which are said to have once covered up to 35 acres, and around which the ruins of the abbey’s gatehouse, built in the 14th century, still stands (on private land), although in a somewhat ruinous state, but under preservation. The abbey was originally built on what was an island called Cow Holm, surrounded by marshy land and the rivers Bure and Ant which meet each other at this point. According to documented evidence the site was first inhabited back in the early 9th century by an Anglo-Saxon, Benedictine monastery, then later the Vikings invaded the area and destroyed the abbey, but in the early 11th century a larger, more influential Benedictine abbey was established on the site. The ruins are difficult to reach from the A1062 near Ludlam half a mile north via trackways and paths, but rather easier to reach by boat on the nearby River Bure, in what is a nice part of the Norfolk Broads. The city of Norwich lies roughly 7 miles south-west on the A1151, while Great Yarmouth is 10 miles to the south-east along the A149 on the Norfolk coast. About 800 AD a hermitage and chapel existed here with Suneman as the founder but he was murdered by Viking invaders; then a small Anglo-Saxon monastery for Benedictine monks was established here but not a great deal is known about it and it did not last long because Viking invaders pillaged and destroyed the building in 870 AD – it’s unclear as to what happened to the monks, if they survived at all? The place lay abandoned and ruined until about 960 or perhaps 980 when the abbey was partly rebuilt by Wulfric the hermit and, by 1019-20 King Cnut granted the abbey and it’s ‘lands’ to the Benedictine order once again, and they then extended, enlarged and fortified the building under the first abbot, Elfsige, making it into a thriving and quite wealthy religious centre of learning. King Cnut ruled from 1016 to 1035. During the Middle-Ages the abbey of St Benet’s (named after St Benedict, founder of the order) prospered and eventually owned upto 35 acres of land here, and eleswhere; some accounts put this at 80 acres. The monks founded two hospices for the sick at Horning, Norfolk, and another for the poor at Great Hautbois, Norfolk; and there were also dependancies at Bury St Edmunds, Suffolk, and Rumburgh, Suffolk; they also had charge of many local churches. The monks farmed the land around their abbey and kept fish ponds – they were probably very self sufficent. By 1539 only a handful of monks were allowed to remain at St Benet’s and in 1545 it was finally abandoned and the remaining monks expelled by bishop Rugge of Norwich who had been given their land by King Henry – much of the stone being robbed away and used in the local area, or further afield in Norwich; only the gatehouse has survived and scant walls of the church, dating from 1270. The abbey did, however, survive the Dissolution of the Monasteries and for this reason the current Bishop of Norwich can still call himself ‘abbot of St Benet’s Holme’. Today some of the abbey walls still stand but are only a shadow of what height they would originally have been. At the east end the stone altar supports a wooden cross of recent date. Around the site, just to the north, there are numerous other foundations of the conventual buildings, precinct wall, earthworks and even the monks fishponds. The abbey gatehouse, to the north-west, is in a ruined state but is under preservation. The conical-shaped windmill dates from about 1760-80 but no longer has its roof or sails; it was later used as a drainage mill and wind-pump. A causeway across the marshes was built by the monks and is still just visible to the west and there are traces of boundary ditches and banks, marking the extent of the abbey’s lands much further to the west close to Horning (St Benedict’s) church. Choir stalls from the abbey can be seen in nearby St Helen’s church, Ranworth. Bottomley, Frank., The Abbey Explorer’s Guide, Kaye & Ward, London, 1981. Butler, Lionel & Wilson-Chris Given., Medieval Monasteries of Great Britain, Michael Joseph Ltd., London, 1979. Categories: Abbey or Priory, St Benet's Abbey at Holme in Norfolk | Tags: St Benet's Abbey at Holme in Norfolk | Permalink. OS grid reference SR 9669 9296. At the church of St Michael & All Angels in Bosherston village take the road opposite (Buckspool lane) out of the village for about 1 mile. If there is an MOD sign displayed you may not be able to proceed any further for a few hours due to military training on the firing range. There is a car-parking area on Travallen Downs by The Pembrokeshire Coast Path – just above the medieval chapel of St Govan which nestles down on the rocky shoreline below the precipitous cliffs of St Govan’s Head. 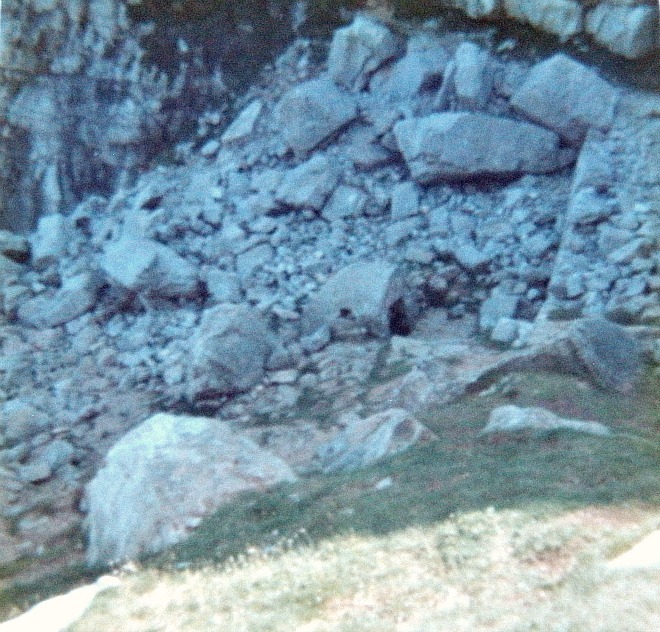 A flight of stone steps leads down between a large ravine in the cliffs into the ancient little building; the number of steps varies between 50-70 but there are said to be 52 steps all told. However, it is difficult to count the exact same number coming back up again! Near the chapel there is a dried up holy well called Ffynnon Govan (St Govan’s Well). The place has been regarded as a sacred and holy pilgrimage site since the Middle Ages, a place where miracles of healing were wrought in past times; even the soil is said to be curative. The county town of Pembroke is roughly 7 miles to the north on the B4319. The little chapel solidly built of limestone is said to date from the 13th century – being restored at that time, so I think we can assume that there was an earlier chapel on this site, possibly one founded by the saint himself. Inside the building measures 18 feet by 12 feet and it’s roof is vaulted. At the eastern side an entrance leads to a hermit’s cell in the cleft of a huge limestone boulder. According to the often-told legend: the saint was pursued here by marauding sea pirates; he hid in the cleft of the great boulder which then closed up, hiding him from view, or his hermit’s attire matched the rock thus he became invisible. You can still make out some marks in the boulder that were made by the saint’s fingers when he hid here back in the 6th century AD. If you make a wish while standing in the cleft of the rock, facing the wall, your wish will be granted, hopefully! 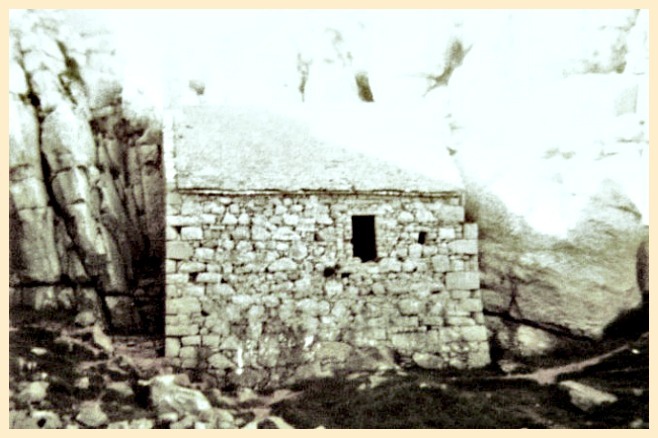 At the side of the hermit’s cell is a stone altar beneath which, according to legend, St Govan is buried. A holy water stoup (piscina) is built onto the wall and, beneath this a spring of water runs out of the ground but is never said to run across the chapel floor, though it has been known to happen! The spring is said to have miraculous healing properties. There is a recess in the wall (aumbrey) that may have been used for sacred vessels or perhaps relics, and there are some solid looking stone seats up against the wall. The little bellcote on the roof did once possess a bell but this was long ago lost to the sea; it can apparently still be heard ringing on stormy nights from beneath the turbulent waves off shore, foretelling an impending disaster at sea. Another tale put forward says the bell was stolen by pirates, but later rescued by sea nymphs who placed it inside a rock near the chapel. It was said that if you struck the rock the bell would ring out. So who was St Govan? It is strongly believed that he was St Gobhan who founded the monastery of Dairinis-Insula near Wexford, Ireland, about the year 530 AD and was a follower of St Ailbhe, bishop of Emlech (Emily) in County Tipperary. Gobhan (Govan) came as a missionary to south-west Wales in old age and became a friend of St David. He may have been present when St David died in 589 AD? Gobhan became a hermit in south-west Pembrokeshire and lived out the rest of his life in a cell beside the rocky cliffs, now known as St Govan’s Head. His feast-day is celebrated on 26th March. He died towards the end of the 6th century, and is patron saint of builders. However, some individuals have tried to link the name Govan with Gawain, King Arthur’s knight who supposedly retired to this hermitage after the death of Arthur, or to a St Cofen, daughter of King Brychan. This is unlikely. And St Ailbhe, mentioned earlier, also came to Wales and baptised Wales’ future patron St, David, at Porthclais. He is called Aelbyw or Elvis and was said to have dwelt in the area to the east of Solva at St Elvis farm, now named after him. At Bosherston in the medieval church of St Michael, a stained-glass window shows St Govan as a bearded old man holding a model of his chapel; another window shows St David, patron St of Wales. The churchyard has a 14th century preaching cross with a tiny carved head near the top, which is thought to represent Christ. It stands on two-tiered steps that enabled it to be used as a sort of stone crucifix. The cross was found in the 16th century having survived the Reformation; the head was placed on top a standing stone that may date back to pre-Christian times or the Dark Ages? Jones, Francis., The Holy Wells of Wales, University of Wales Press, Cardiff, 1992. Categories: Ancient Churches / Chapels, Holy Wells, St Govan's Chapel at Bosherston in Pembrokeshire | Tags: St Govan's Chapel near Bosherston in Pembrokeshire Wales | Permalink. 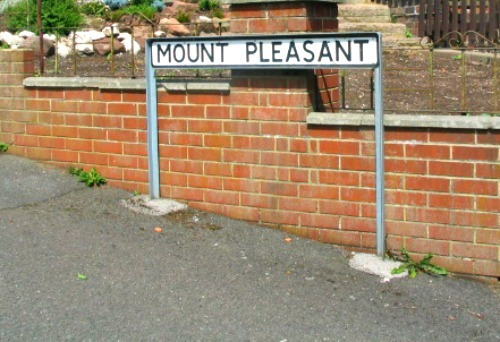 Mount Pleasant Sign at Chesterton. OS grid reference SJ 8302 4900. This Roman site in north Staffordshire is a difficult one to examine in any real detail as there are no tangible signs of earthworks showing up from the late 1st century fort, or what’s left of it, which is partly buried under Chesterton High School (now known as Chesterton Community Sports College) between Mount Pleasant and Castle Street and the recreation fields at the back where there are some very faint, linear crop-marks. Was Chesterton the Roman town (vicus) of Mediolanum – about which some Roman historians have alluded to? Quite possibly, but still some uncerainty. From what is known the auxiliary fort was built in the early Flavian period circa 70 AD after an earlier temporary fort at Trent Vale (Stoke on Trent) – a few miles to the south had been abandoned. The fort was apparently linked to a temporary Roman marching camp at Loomer Road, 400 yards to the south, where the Roman Catholic church of St John now stands, and it’s earthworks are still said to be visible at the south-east side of the church. And at Holditch, some 800 metres to the south-east, there was a Romano-British settlement of the late 1st to early 2nd century AD. Here a number of Roman artefacts were excavated. The town of Newcastle under Lyme is one and half miles to the south of Chesterton on the A34, at the north-western edge of The Potteries. The northern section of the fort lies under the high school buildings and the southern section under the fields and recreation areas at the back, and roughly following the field boundarie there – where some very faint linear crop marks can be made out in the large field. Apparently the mainly timber-built fort was parallegram-shaped (rectangular) and measured 365 yards by 300 yards, according to Pastscape, which would be around 4 acres all told, so a medium to large-sized auxiliary fort on the Roman road called RYKNELD STREET, which ran from Derventio (Derby) in the east to the fort at Rocester and, in the west to Salinae (Middlewich), Condate (Northwich) or, according to some, Kindeston, and then on to Deva (Chester). The fort at Chesterton would have held a cohort of 500 to 600 soldiers quite comfortably, I would imagine. After the demolition of a house called ‘Mount Pleasant’ in 1969 excavations were carried out on the site of the fort for a period of 2 years. A defensive bank running alongside the lane, at the north-west side, was found and also the defenses of the south-eastern side, but sadly no antiquities of any note, apart from a stray silver coin found by a pupil during a school dig [June 2013], and some early Flavian pottery from the ditch. From what is known, however, its timber rampart was 20 feet wide and at the front of this two ditches made from clay and turf were some 20 yards wide; the rampart apparently was shortened or cut back and then the inner-most ditch (15 feet wide and 6 feet deep) with a square-shaped drainage channel, was filled in. The fort appears to have been built in “one” construction phase rather unusually, perhaps, whereas many Roman forts had two or even three phases of construction. A clay oven and the remains of the cook house were discovered – the latter had been built onto the timber rampart. Between 1593 and 1603 the antiquarian, Sampson Erdeswick, recalled in his work ‘A Survey of Staffordshire’ that the surviving walls were of “marvellous thickness”. So if we take that at face value the ramparts were made of stone-worked walling of some kind – probably sandstone fragments in hard clay, although sadly all that was either robbed away or bulldozed as there are no visible signs of any stonework today. The north-west corner of the fort abutted up against a sandstone outcrop which helped form the defenses there. There was a bath-house on the site though it is uncertain whether this was situated inside or, on the outside of the fort – they were usually outside. The nearby Roman marching camp at Loomer Road, Chesterton, measured 325 feet by 315 feet around 2 acres and was square-shaped; its earthworks are still visible at the south-east side of the Roman Catholic church of St John the Evangelist, while the Romano-British settlement at Holditch further to the south-east has all but vanished. However, quite a lot of pottery has been found on the site, as well as a pottery figure of Venus, glass beads and a bronze bell. At Trent Vale a pottery kiln from the Roman period was excavated, and at Lightwood near Longton, a hoard of Roman coins was unearthed. Many of these artefacts can be seen in the Newcastle Under Lyme museum in Brampton Park. There are some Roman antiquities from the Trent Vale site on display in The Potteries Museum at Hanley, Stoke-on-Trent. 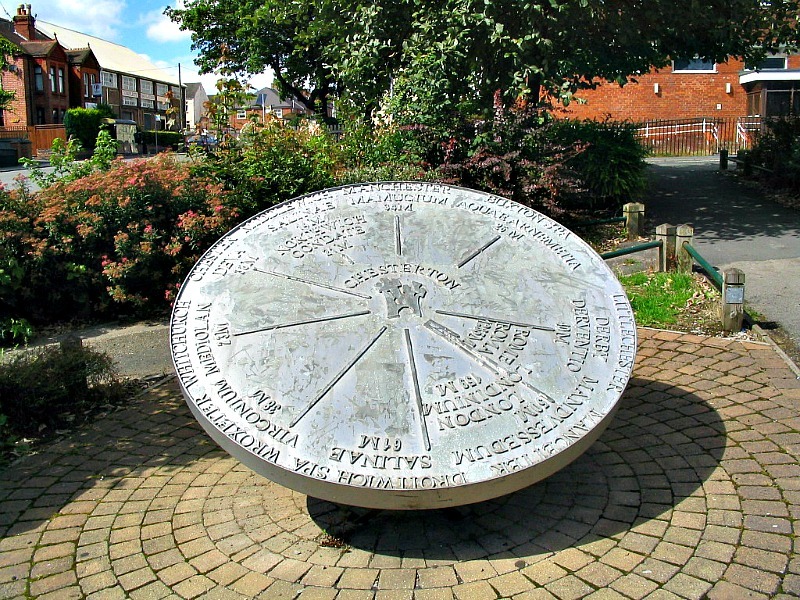 And the Chesterton mileage disc set up at the Millennium in 2000 can be found at the corner of London road (B5500) and Wolstanton road (B5369) in Chesterton and is part of the ‘Midlands Heritage Forum’. The disc displays the mileage in ‘Roman miles’ between various Roman forts and towns in England with Chesterton at the centre. Also, at ‘The Apedale Heritage Centre’ on Loomer Road, Chesterton, Newcastle-under-Lyme, there is part of the wall from a Romano-British building, information on the site at Holditch and the invasion of Britain in AD 43. Erdeswick, Sampson, A Survey Of Staffordshire, J.B.Nichols & Son, London, 1844, 22. Thanks also to Barrie Collinson for the info on The Apedale Heritage Centre. Categories: Chesterton Roman Fort in North Staffordshire, Roman Sites | Tags: Chesterton Roman Fort in North Staffordshire | Permalink.